We are excited to present our first new product since 2008. With MatchedBetting, you can earn hundreds of euros just by taking advantage of the bookmakers bonuses. Matched betting is a way to profit from the bonuses, free bets and other incentives offered by bookmakers. Our goal is to build the world’s best matched betting software. After a successful beta, with lots of great feedback we are now ready to launch. 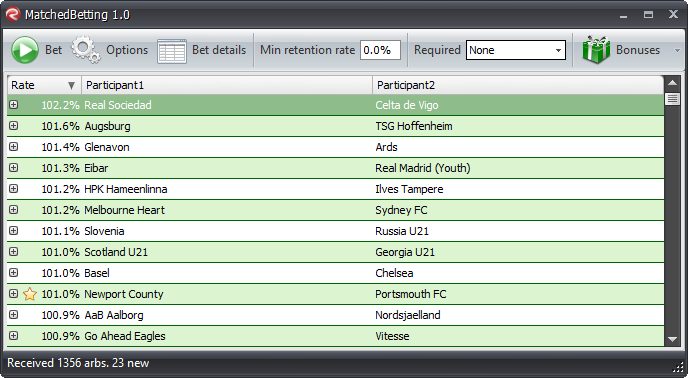 The product works both on its own, and together with RebelBetting as a complement to sports arbitrage trading. And if you haven’t already, don’t forget to check out our extensive beginners guide!